JERUSALEM: Almost 10,000 Muslim worshipers returned to Jerusalem's Al-Aqsa Mosque to pray on Friday evening after Israeli police lifted all security measures. On Friday dawn, Israeli police canceled age restrictions to Palestinian access to Jerusalem's Old City and reopened all gates to the mosque, several days after they removed metal detectors from the entrance of Jerusalem's holy site. The moves came after two weeks of protests by Palestinians who refused to enter the mosque under the new Israeli security measures. The conflicts occurred in the wake of a shooting attack on July 14 that left three Palestinians and two Israelis killed. 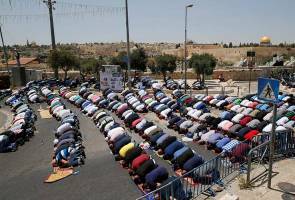 "We hope all the situation to be like this calm," said Issa Kirresh, a Palestinian worshiper. The tensions seem to be eased a little bit. However, Israeli police with guns were still seen guarding the entrances of the mosque. Commenting on the tensions in recent two weeks, an Israeli senior journalist said, the conflict is the result of long-term stagnation of the peace process, with Palestinians feeling weaker sense of belonging. In the long run, resuming peace talks is the solution, but now finding a way of peacefully living is of utmost importance. "We are not saying peace process for no good reason. It takes time to talk about all the contentious points. But it's a long process. Until we get there, in the meantime, both sides should change their ways, and the rhetoric towards the other population," said Elli Hochenberg, a senior journalist at i24NEW, an Israeli international television at the West Bank. Let's Talk: Palestine - Is Apartheid the Right Framework?